If you have small children (or are generally a messy eater) then these oilcloth reupholstered chairs are for you! I had grown tired of constantly trying to dab out stains and spills on our tan colored dining cushions. 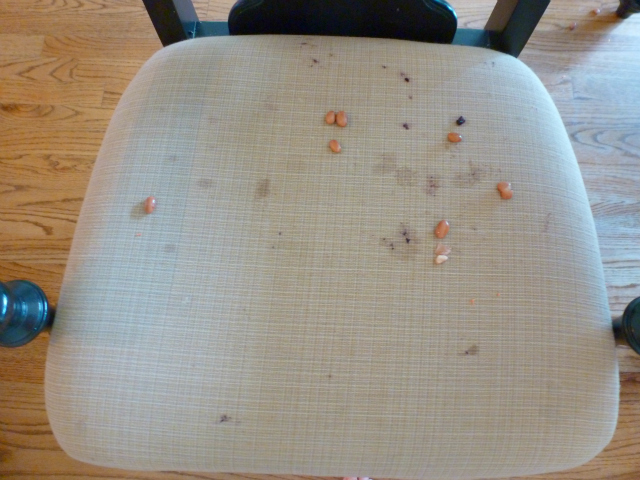 When Hazel dumped her plate of pinto beans and blackberries onto this already stained dining chair a month ago, it was the last straw! I figured there had to be a better way. We had tried clear plastic seat covers laid over the girls’ chairs, but they slid around and weren’t terribly pretty. Then I came up with the idea to reupholster them in oilcloth – a vinyl coated fabric that makes it super easy to wipe up any spills. You’re probably used to seeing the bright floral and fruit covered oilcloth popular in of the 1950s or so, but I found this modern metallic gold striped oilcloth from Etsy seller Oilcloth By The Yard. They sell the stripes in a variety of colors – check them out! 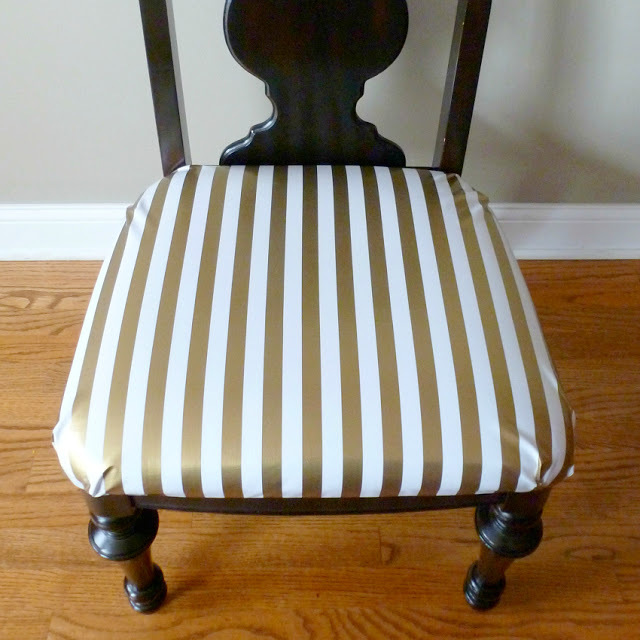 Measure your chair cushion to determine how much oilcloth you will need (give yourself an extra few inches on each side) to cover all your chairs. I needed a yard of oilcloth per chair. Turn the chair upside down to unscrew and remove the seat cushion. Center the cushion on your oilcloth and cut around it, making sure to leave an extra few inches around each side (which will be folded over and stapled to the bottom of the cushion). 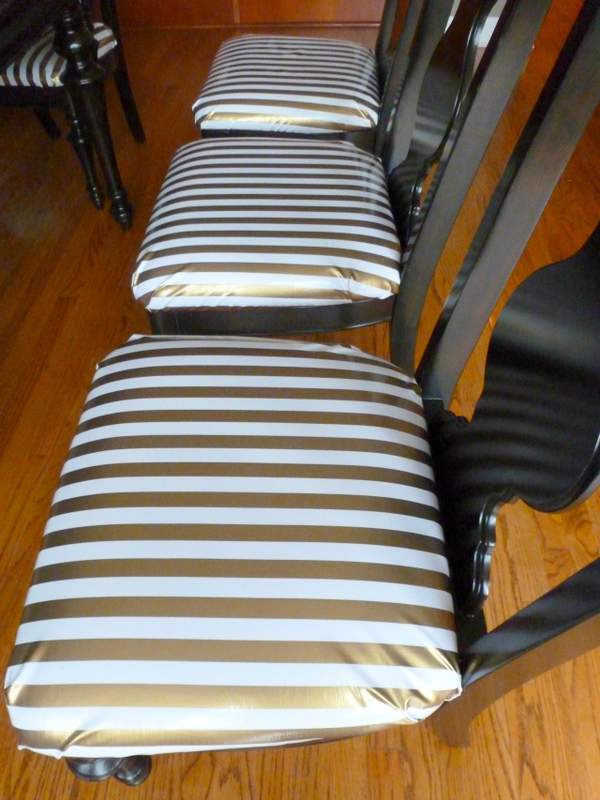 Using a staple gun, start stapling the fabric to the underside of the cushion. Most tutorials tell you to start by putting one staple in the middle of each side of the cushion, and then working in towards the corners, stapling every couple inches. We tried that method, as well as starting at the corners and working towards the middle. For oilcloth, I think the later might work a little better. The downside to using oilcloth vs. regular cotton fabric is that it is thicker and doesn’t form to the cushion as easily. Your corners won’t look as neat and seamless as they could with thinner fabric (if you know a trick to overcoming this, please do share!). Regardless, make sure you pull the fabric taut between stapling and try to fold the corners as neat as possible (like the edges of a package), cutting excess fabric as needed. Once the fabric is stapled, reattach the cushion to the chair. The next time there is a spill, just wipe away with a damp cloth! 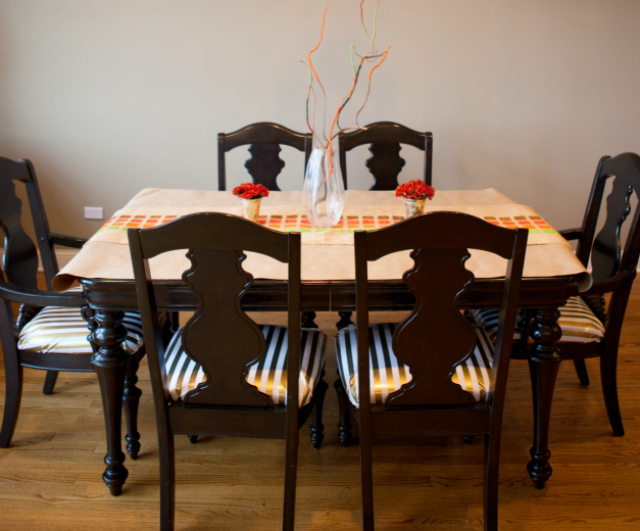 It feels so nice to sit on dining chairs that aren’t stained. I also like the touch of metallic it brings to our dining room. 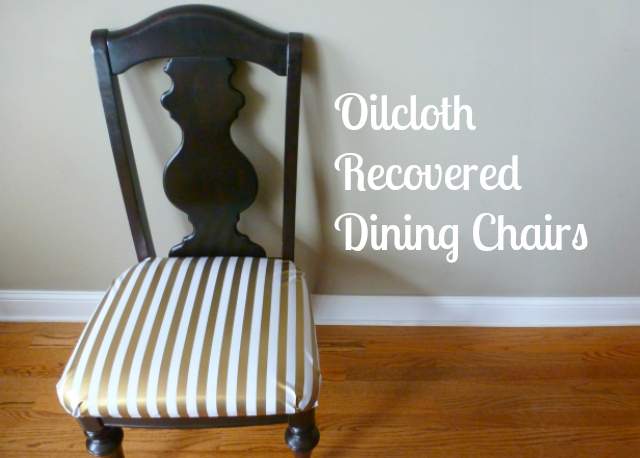 Oilcloth might not be the perfect fabric to recover a cushion, but it is a great solution for busy moms! Do you follow Design Improvised on Twitter? If not, you should! You can follow me @dimprovised!